Happy Saturday! This past week was a short week for me since I took a few days off from work to spend time with our families for the Lunar New Year. 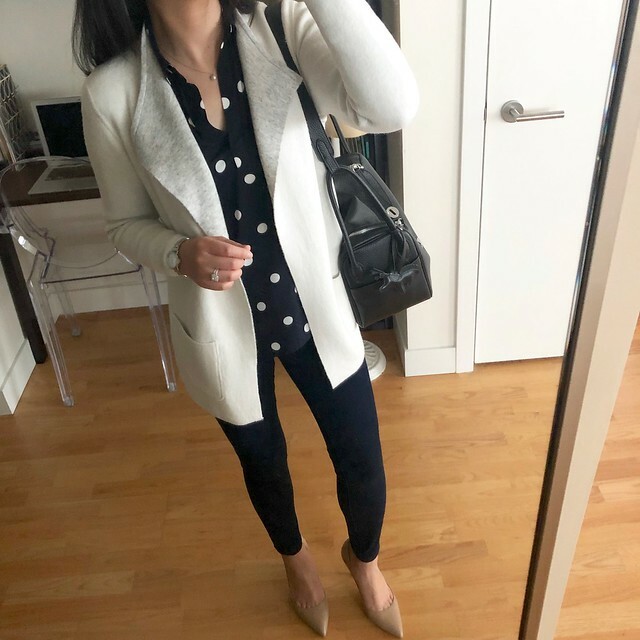 I finished off the week with this outfit which features a few new pieces from my recent purchases. I’m happy to be back with a new post with a few new reviews. 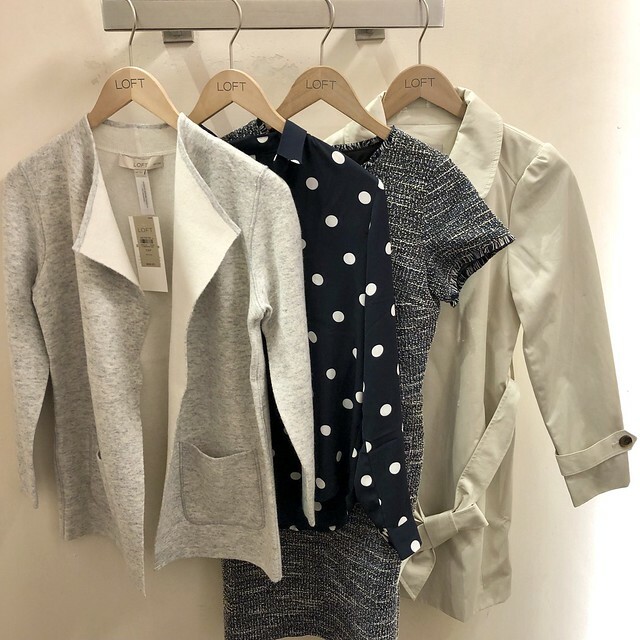 Get 40% off jewelry, shop $35 sweaters and jeans, $49.50 skirts, dresses and PLUS dresses and save an extra 40% off sale styles at LOFT. Since no code is needed on select full-price styles use code INSIDER249 for an extra $25 off $100+ (excludes Lou & Grey and clearance styles). If you’re waiting and wondering when the next everything sale is my best guess is next Wednesday or Thursday. I had shared last February’s sales on my Daily Updates page. 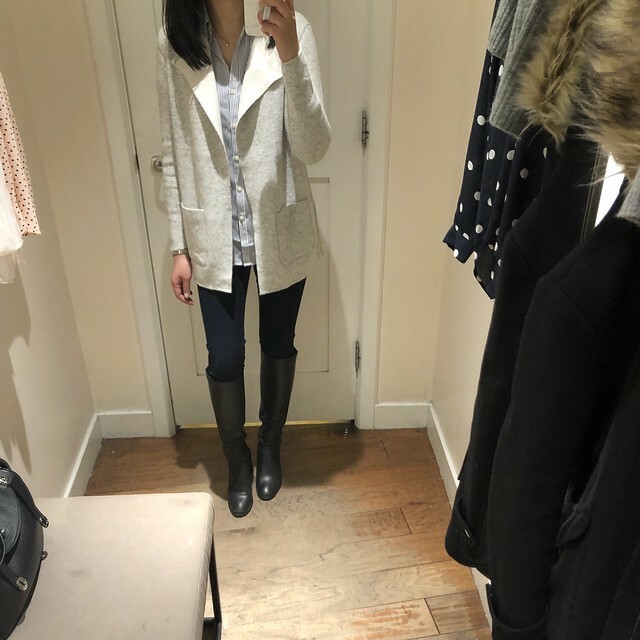 I was curious about this new trench coat but when I tried it on it wasn’t yet on sale. Size XXSP was too snug and the arm holes were cut very high so they dug into my armpits. I then grabbed my usual size XSP (pictured above) to try on and I found that it fits true to size. 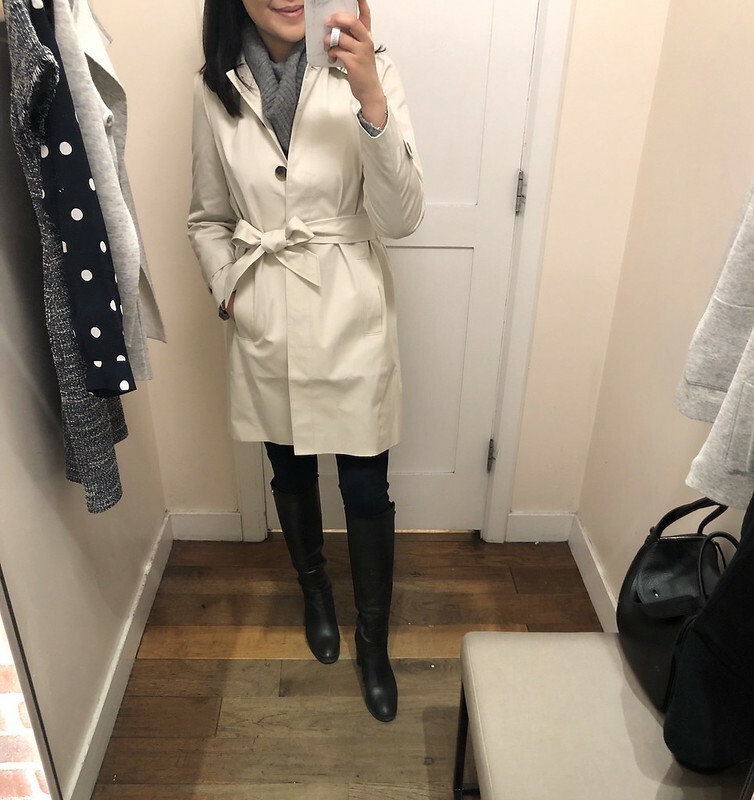 The trench is a thinner material and the lining inside doesn’t have a print.The shell is 100% cotton and the lining is 100% polyester and the care tag states machine wash cold or dry clean. The measurements of size XSP are as follows: 13.5″ shoulders, 14″ upper arm circumference, 22.5″ sleeve length, 35″ chest (measured pit to pit), 36″ waist, 42.5″ along the bottom hem and 32.75″ total length. 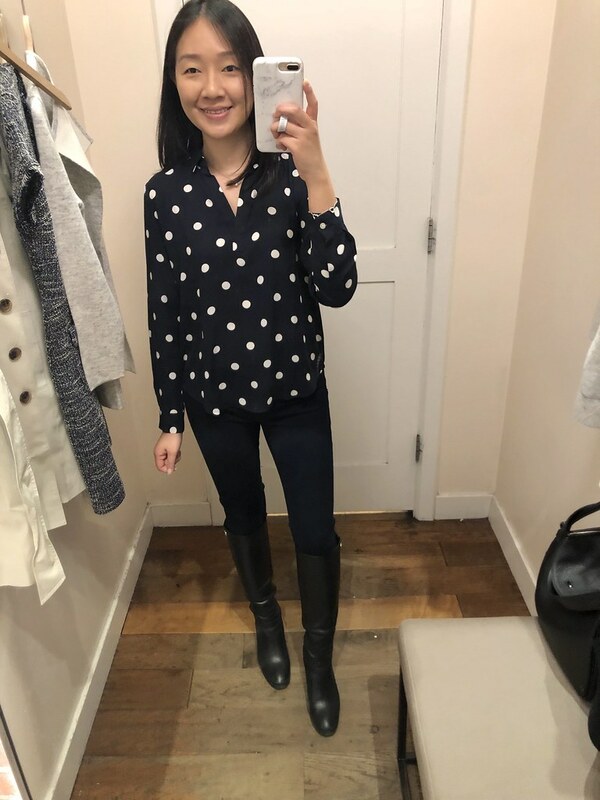 This polka dot blouse is really cute but the fit is a bit looser in my usual size XSP so I prefer wearing something over it. 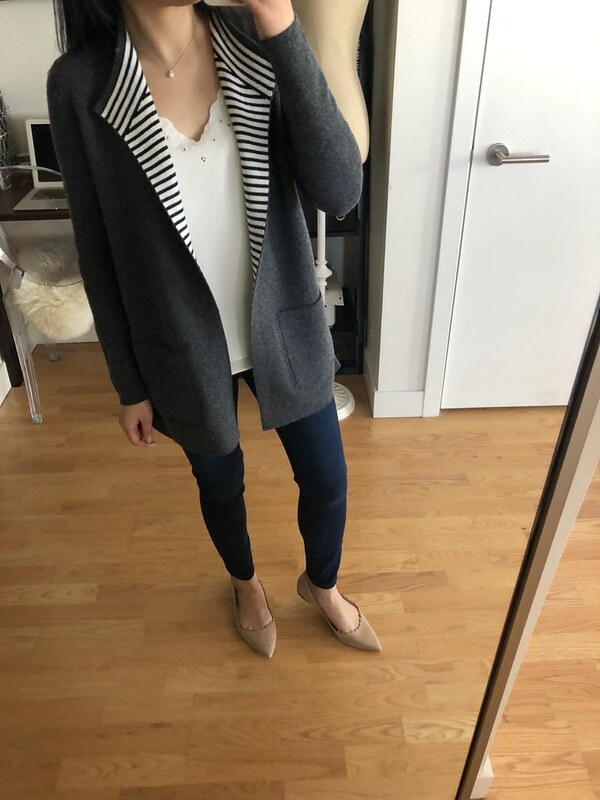 I love this reversible sweater jacket and I took my usual size XSP. 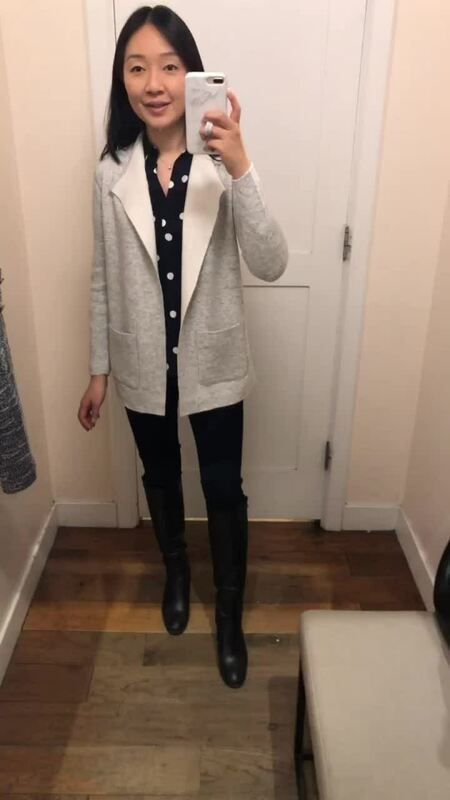 It actually reminds me of this popular sweater jacket from 2014. The measurements of size XSP are as follows: 14″ shoulders, 33″ bust (measured pit to pit), 22″ sleeve length, 11″ upper arm circumference, 27.5″ total length. 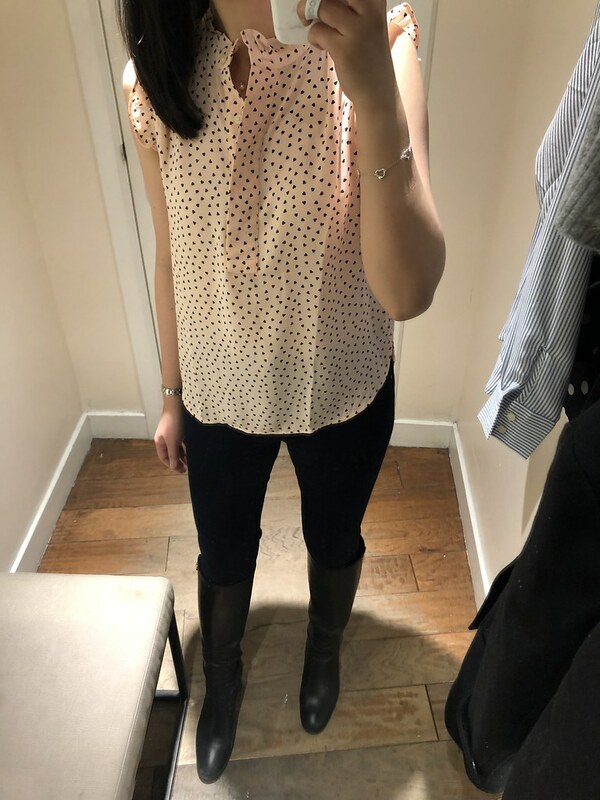 Click here to see size SP on me for comparison which was an oversized fit. 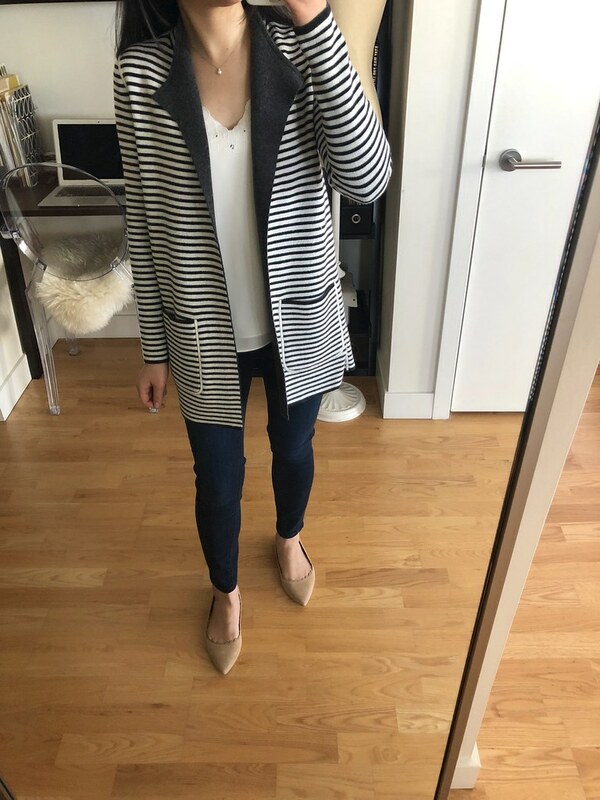 I took the dark grey striped reversible open sweater jacket in size XXS regular. I tried on this heart print sleeveless top in my usual size XSP but the arm holes were a bit narrow and dug into my armpits when I lifted my arms. I believe I need XXS regular for a more comfortable fit. It also looks cute with the above reversible cardigan as seen here. I did get the whisper white color in size XXS regular and I didn’t have any issues with the arm holes. 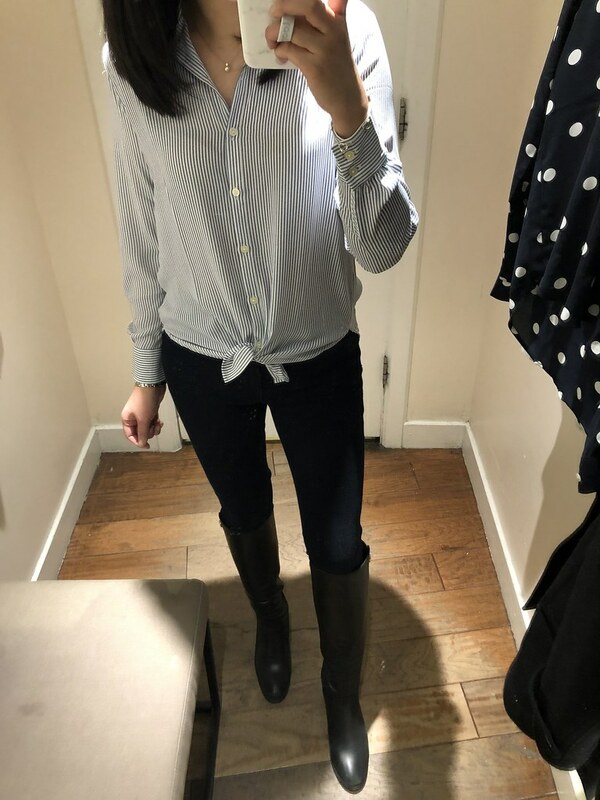 I was curious about this tie hem blouse and I that found that it runs true to size. I sized down for a closer fit at the chest since I plan to wear it untucked as seen here and below with the reversible cardigan. Size XXSP measures 34″ at the chest (measured pit to pit). If I wanted to tie it comfortably at the waist I would take my usual size XSP. 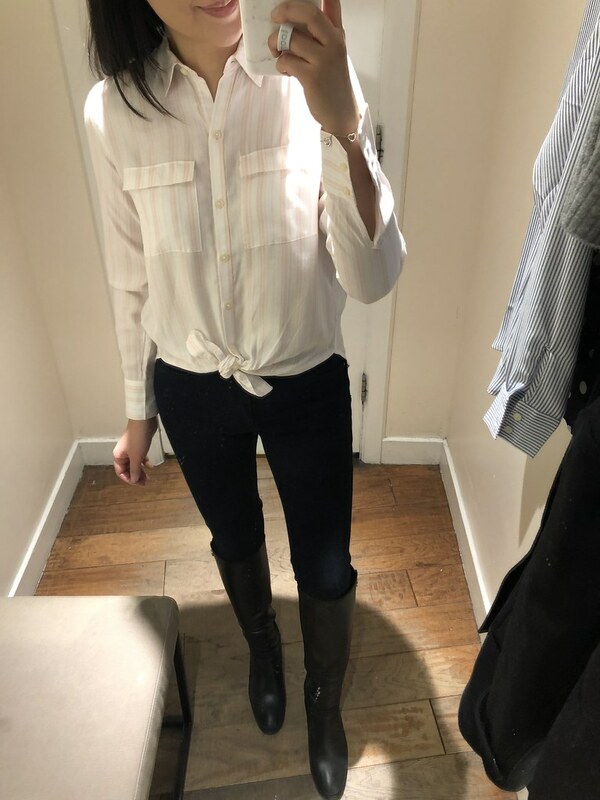 This pink and white striped blouse was also on my wishlist but I didn’t like how it look knotted as intended since the shirttail in the back looks funny from the side if you view the clip I linked to here. It should run true to size for most but I tried on size XXSP since I have a smaller chest. 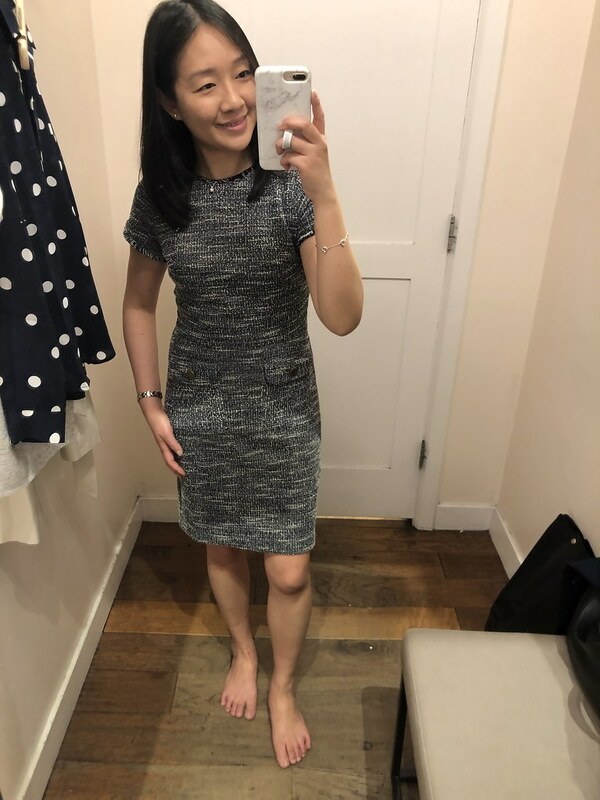 My friend Ly asked me to try on this boucle dress and it was so popular it took me a few visits before I found my size to try on at the LOFT store in Times Square. I always wanted to visit that store since it’s often featured in their Instagram stories for events. It has a really good selection and a lot of staff to keep the store orderly so it also had the neatest sale section that I’ve ever seen. Anyway going back to the dress I found that it runs true to size. 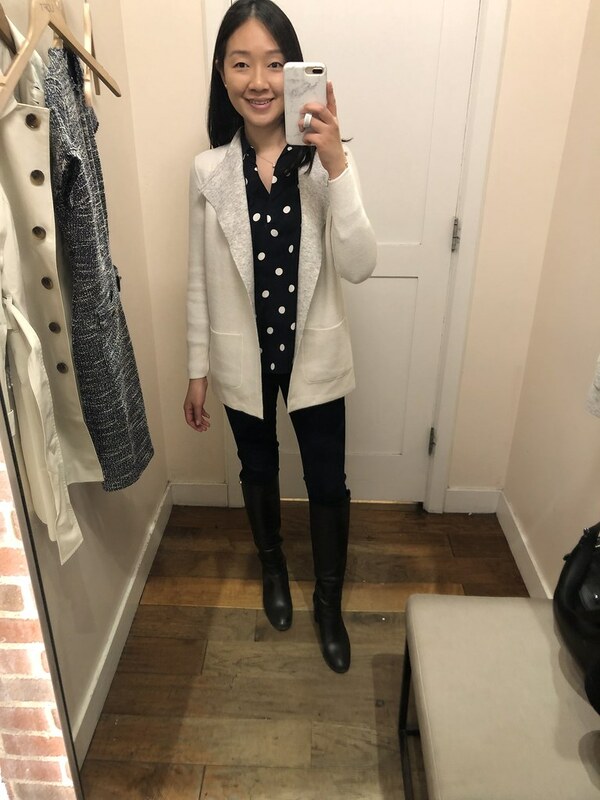 I personally prefer a looser fit like this old fringe tweed pocket dress (review here) so I didn’t feel comfortable with the closer fit through the waist and hips. The material does have a good stretch to it. 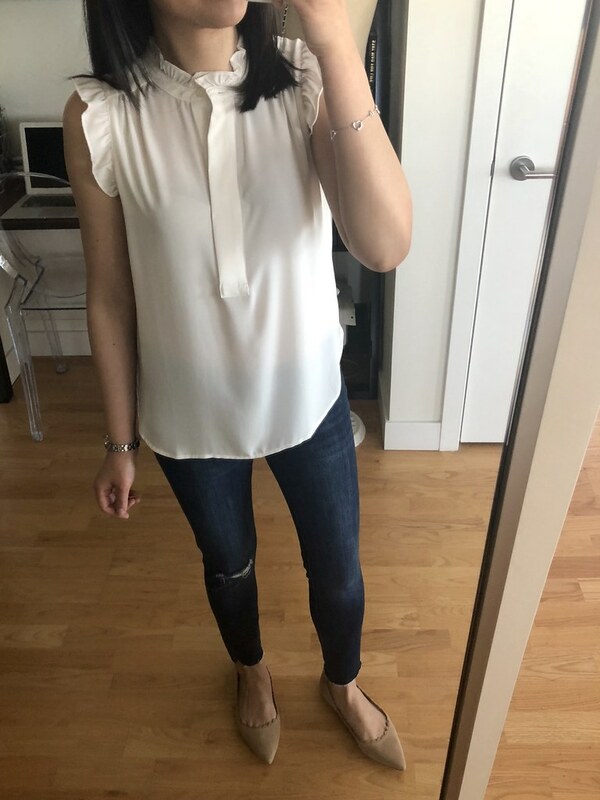 As mentioned in my above review of the heart print shell, I got this whisper white color in size XXS regular and I didn’t have any issues with the arm holes. The material and color is more sheer but I plan to use it for layering purposes. I liked the solid reversible sweater jacket so much I got the striped version as well. 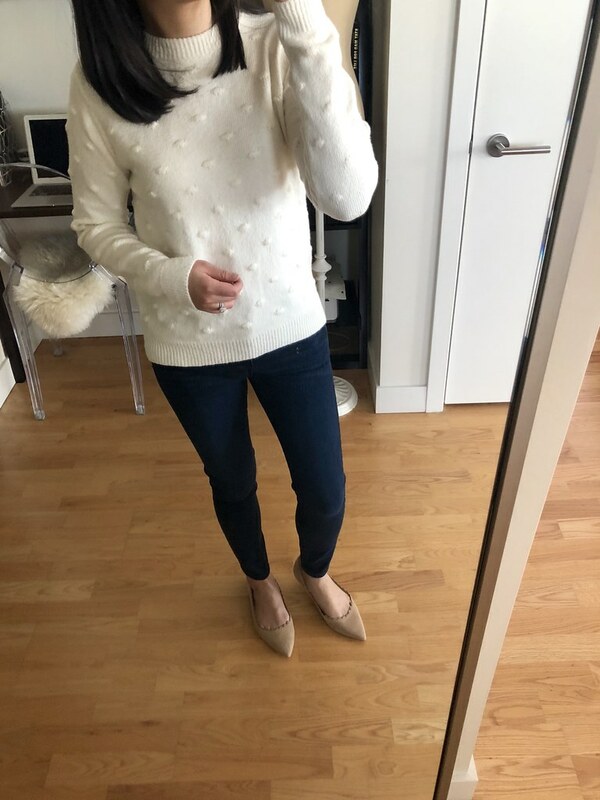 Size XXS regular is a bit longer on me but it still works since this version is not available in petites. The striped reversible side (pictured below) is really cute and unique with the white exposed seams at the pockets, sides and shoulders. 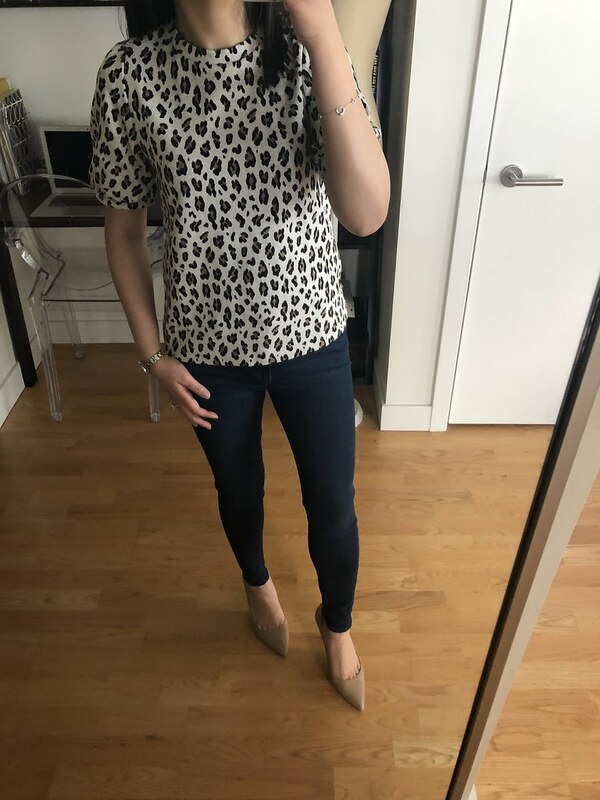 I was curious about this new leopard print top byt I didn’t love the puffy sleeves. Size XXS regular is true to size but it’s a bit shorter at 22″ total length. 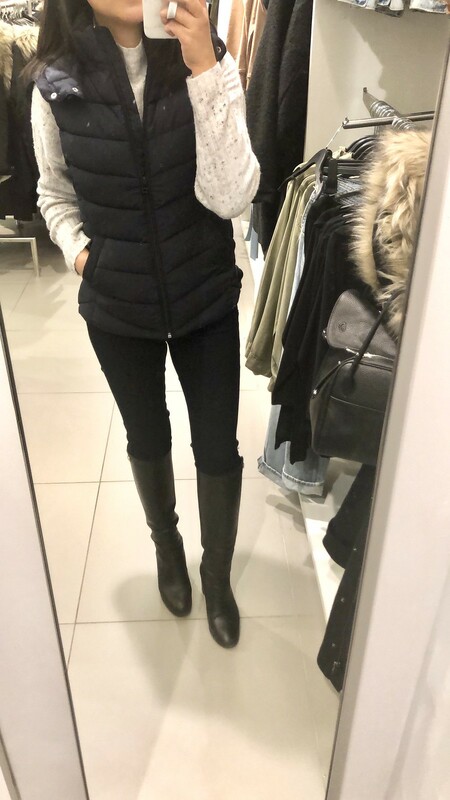 I’ve seen a few LOFT store accounts such as @loveloft_rooseveltfield pair the top with the matching leopard print flippy skirt with looks really cute together. I’ve been searching for a popcorn sweater for a long time and I thought this was a cute option. Size XS fit me well but it took a few weeks to ship since my size was backordered. It’s also available in an olive color. This navy vest is a nice fit since it’s not too loose and shapeless. I wish it came in other colors. Size 2 fit me well.